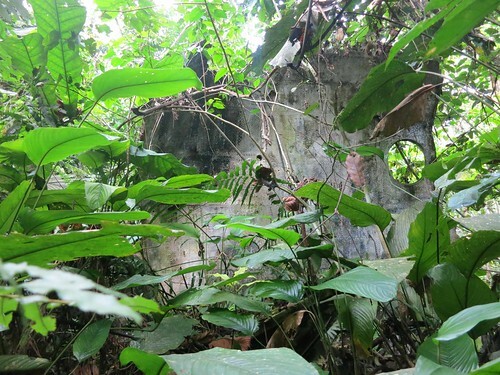 The wreck of an Antonov claimed by the forest long before it was discovered from a remote hunting camp. A few days later, I asked Washi about the plane he’d found. (Washington is one of the park team workers.) Maurice translated for me. “He says about from him to you.” So, about ten feet. A week later we set out to look for it. 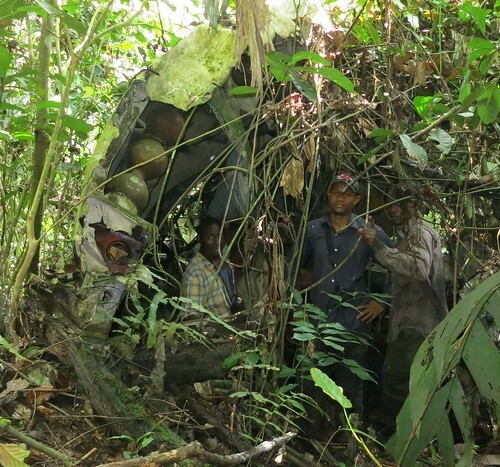 Pablo, Maga, Obadi, Washi, the park-guard lieutenant and I walked fast on small trails through the forest for about 6 kilometers to reach the hunting camp where Washi had been staying at the time. From there Washi led us out along a ridge and down a slope to a small stream about a kilometer from his camp. He pointed into the mud. Small plastic bottles lay strewn in the leaf-mire. “That was the first thing I saw,” he said. Just upstream there was a neat bonobo handprint in the fine clay of the riverbank. 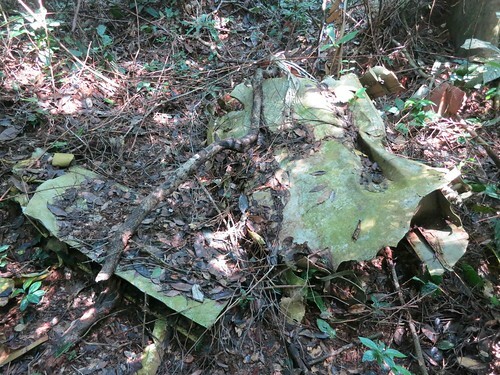 It was a slab of aluminum, about as big as a dining room table, covered in a drift of leaves and small twigs. We brushed it off, stood it upright and pondered it. Definitely part of a wing, or a tail. There were characters stenciled on it, hidden under a green algal film. I spat on them and rubbed with my thumb. Cyrillic. “Why is it in Russian?” I said. An Antonov is a big plane. “Where’s the rest of it? Washi, did you look for more of it?” He shook his head. We decided to fan out and see if we could find other pieces. Almost immediately, looking up, Pablo noticed a small wedge embedded deeply in a branch about twenty feet above us. We moved back down the slope, angling away from where we’d crossed the stream. Other pieces were spotted. They were larger, still slabs of what looked like wings. We crossed the stream again and ascended the slope, into thicker, thornier forest. Maga whistled, and we came running. A big slab of wing, about twenty feet long and ten deep. Washi dug around the torn surfaces, pulling out clumps of wire. He smiled. “Useful!” I pulled a slab of green glass from a shattered lamp-housing and put it in my pocket. We moved on, finding more pieces as we went. The stump of a wheel-leg, ailerons, something like a radiator, big slabs of bulkheaded aluminum paneling with thick sheets of rubber attached. We crossed back through the river, sloshing through the mud, Washi now dragging coils of wire and a length of yellow-painted pipe. 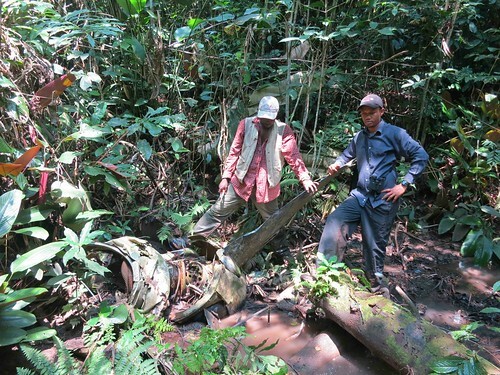 We found a propeller, with five-foot blue blades, bent and chipped and sunk in the stream mud. Then we found fragments with paint on them. Blue and white. The fragments were torn and shredded with unbelievable violence. We realized that slabs of metal were bound up with smashed portions of the trees they’d taken down as they careened to earth. Returning to the stream-bed, which seemed to follow loosely the trajectory of the crash, we realized that it was easier to walk if we just stepped on the half-submerged fragments of the aircraft. The forest was closing in, and it was becoming more difficult to move through it. Thorns caught in our clothes and ripped our hands. Rounding a sort of corner, we found another pile of metal, and a motor. We paused to drink. We followed the debris along the stream. I hopped across the stream, waded out into a grove of waxy Marantaceae leaves and looked down the course. About fifty meters away a huge pile of metal could be seen, vaguely, through a green cloak of vines and leaf. As we approached, it loomed over us, an incomprehensible mangle of big aluminum slabs, flipped and twisted and bent around each other. To one side was a strange bubble-shape, which looked like a gun-turret and had incongruously unbroken slabs of glass framing it. It was clearly from an Antonov. Maga and I went around to the right, carefully ascending the torn planes of metal. Every edge was ragged and sharp. The mass had come to rest against a small slope, where the river turned. At the top of the slope we entered the curve of the fuselage. Inside the small space it was dark. There was a wheelset in there, jammed up against another propeller. Webbing spilled from bent surfaces. Coils of wire stretched taut through the airspace. We all piled in and stood in silence for a moment or two, flipping random switches labeled in Russian on boxes of machinery that hung loosely in midair. As we circled the mass we were constantly stymied by webs of wire and torn metal bound together by vines, grown through by woody stalks, and balanced crazily against big smashed timbers and slabs of savaged metal. It was impossible to approach, impossible to comprehend. There was no coherence to the shape, no cockpit visible. And it was abundantly clear that noone had been here since this plane fetched up against this gentle slope. There were no machete marks anywhere. We were the first to see this. We withdrew, stunned, to eat our lunch. Sweat bees tormented us, settling in clouds on any exposed surface of skin and tickling gently with tiny legs. Their flight was slow, and gentle. We all pulled our heads inside our shirts to eat our rice and sardines. As we were leaving, I noticed a yellow sphere sitting by itself away from the fuselage. It was made of two halves, held together by rusted bolts with thumb-nuts on them. Maga beat the bolts loose with the back of a machete. Inside was an odd little box, with a magnetic tape head and two spools wound with ultrafine metal wire. “Maybe it’s the black box,” said the Lieutenant. We loaded it into the pack with Washi’s trove of webbing, wire, pipes, and rubber and clicked on the GPS. 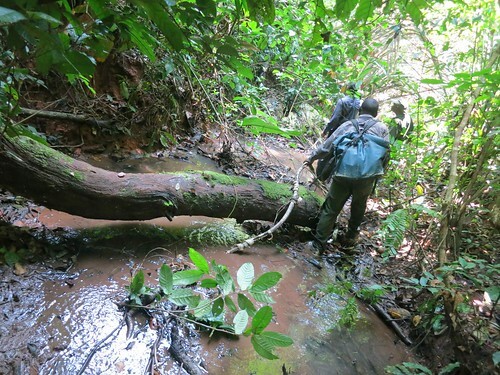 We started picking our way back through the forest towards Obenge. 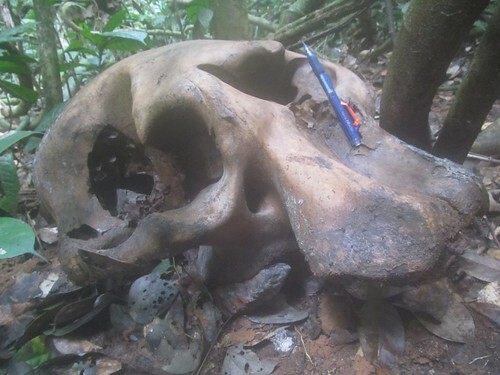 The most common debris found in the forest of Obenge is from elephant poaching. Here the killing is recent enough that all the vegetation is still “burned out” from around the rotting flesh. Tusks of course are gone. 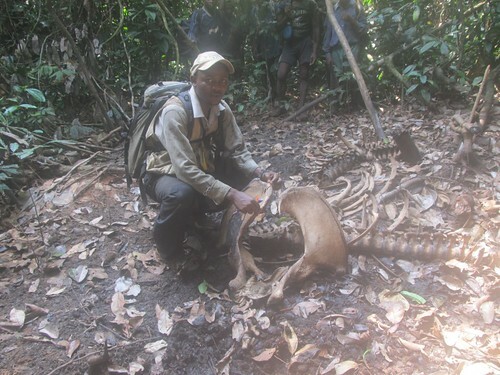 Account by Roger Peet, volunteer with the TL2 project. This entry was written by Terese Hart, posted on 2013-02-24 at 4:24 pm, filed under About the project, Elephant, The Forest. Bookmark the permalink. Follow any comments here with the RSS feed for this post. Post a comment or leave a trackback: Trackback URL. it is not a surprise. 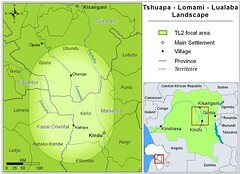 The Congo forest is vast as an ocean. What is surprising, though, and very disturbing, is how many elephant carcasses we find. 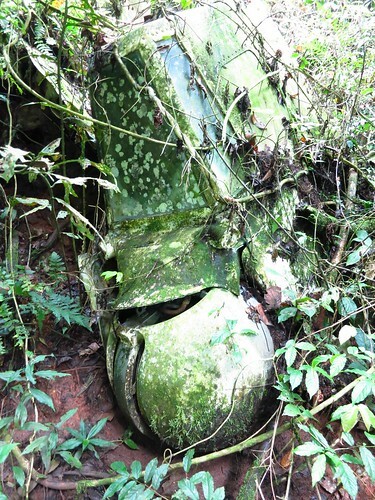 If the forest can hide a huge Antonov wreck for 5 years and yet we keep coming across new elephant kills — then how many more is the forest hiding? Thanks for your interesting post. Do you happen to have the GPS coordinates of the wreckage? I am trying to determine exactly what airplane it is that crashed. It seems an Antonov An-12 based on the photo from the tail. 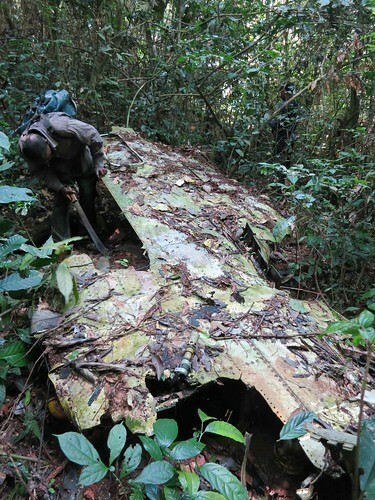 Several of those have crashed in recent years in DRC. Although the photo link is to an Ilyushin-Il-76M. I would like to know the end of the storie?Did u found out which airplane was it?